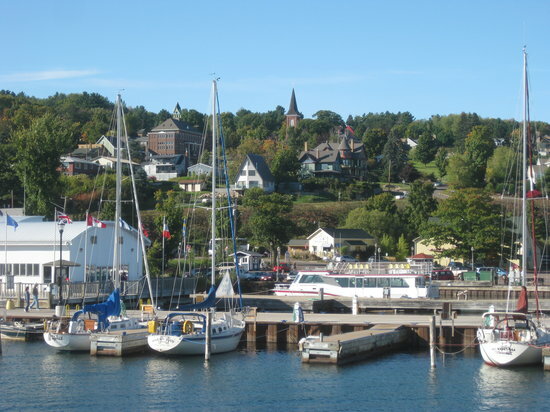 This weekend my family Derek and I are off to beautiful Bayfield WI. Bayfield is a meer 4 hours away from Minneapolis and is located right on Lake Superior. biking around Madeline Island, hiking, shopping and enjoying local dining in a number of quaint restaurants. And lets not forget the beautiful scenery - who wouldn't want to wake up and stare at this while drinking coffee? So what exactly are our plans this weekend besides relaxing? Well eat of course, exploring, I am sure a bit of shopping and hopefully biking and hiking if it is nice! We are also having a late Father's Day celebration and celebrating my mom and sister's birthdays! I am looking forward to a weekend of being with family and relaxing! And I thought since it is the weekend and all that I would leave you with some tasty recipes! PS - these are all apple and berry recipes because Bayfield is known for their orchards and berry farms! These look like great 4th of July recipes too!!! Have fun this weekend!